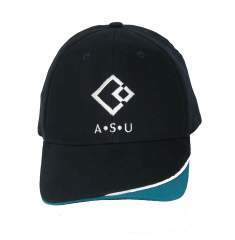 This great looking navy blue cap has a white piping and teal feature panel on the peak. Printed on the front in white is the ASU logo. The 'Active Strong United' logo is printed across the back. One size fits all with an adjustable strap at the back. Wear It Proud!